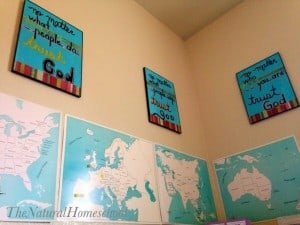 Welcome to our homeschool room! We are happy that you have chosen to pay us a visit. We hope you like what you see. 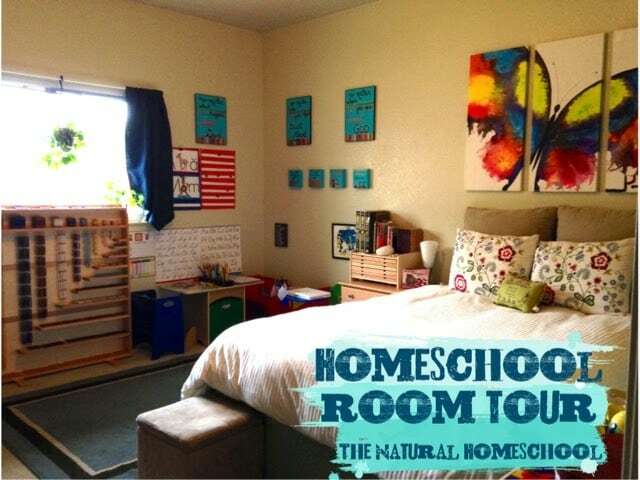 Not only is this room our homeschool room, it is also a guest bedroom whenever we have family visiting. I know that having a queen-sized bed in the room takes a lot of room, but we have put it to good use when we don’t have guests. We sit on the bed to read, to review our Classical Conversation material and even to nap when we need an extra bed. In all honesty, it doesn’t bother me having a bed there anymore. 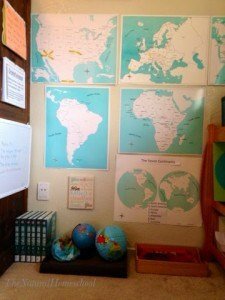 It makes our homeschool room look less like a classroom and more like a HOMEschool room. 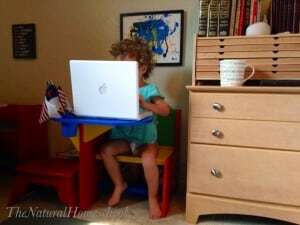 Plus, we homeschool two children; we have more than enough room to do our work. If we have a project involving paint, we use the kitchen counter for those. 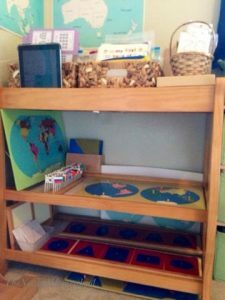 We have Montessori materials throughout the room, but this cabinet is the one that holds most of it. At the lowest level (on the carpet), we have a puzzle map of Europe. 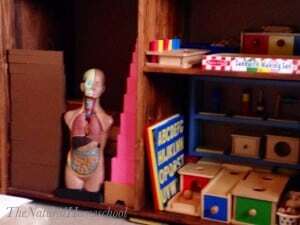 Most of our Science materials are in shelves in the closet (not shown). I separated them into bins (Geography, History and Culture, Botany and Earth Science, Zoology and Biology). 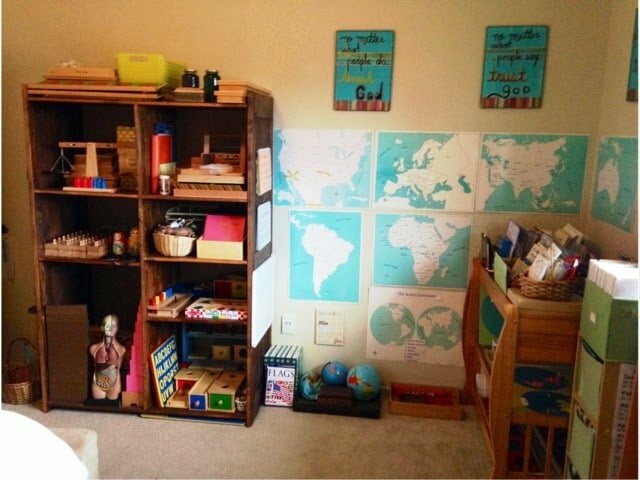 Everything in the lower level is strategically placed there for my children to reach and work with as they choose. We like to keep the Brown Stair, the Pink Tower, the Binomial Cube, the Knobless Cylinders and the Constructive Triangles within reach at all times. I also like to keep the Toddler work down low (like the Object Permanence boxes 1, 2, 3, Imbucare boxes and dowels 1, 2, 3). They can always ask for me to reach something for them (higher levels). 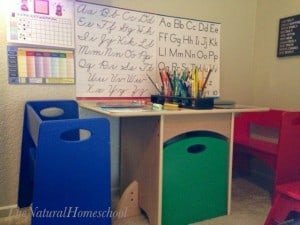 I know that The Montessori Method suggests that all work must be able to be accessible to the child(ren), but because of our available space, we are doing the best we can and it works very well for us. This is where we keep our mats to do our Montessori work. 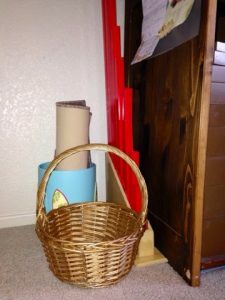 We take our shoes off every time we walk into our homeschool room and place them in the golden basket. The Montessori Red Rods are tall, so this is the perfect spot for them. As you can see, we love Geography and dedicate much of our time learning all about the Earth. We have a map of the seven continents (bottom) and a separate map for each continent (except Antarctica). We also have a small Geography encyclopedia, assorted globes and our Toob Monuments and Landmarks. On the left, you see a re-purposed changing table. 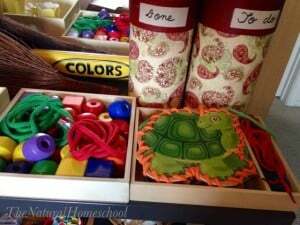 At the top, I have Toddler material such as small books, flashcards, file folder games, cutting exercises, matching games/cards, sight word lists, puzzles, etc. These materials are varied and cover all subjects. Every day, I go to the basket (start on the left) and take out the three activities that are at the front. When done, I put them back at the very back of the basket on the right. So those activities cycle through every couple of months. Many of them are free printables (like the tot packs from 3Dinosaurs) and handmade materials to cover all bases. She really enjoys this time. In the middle level, we have more Montessori Geography work (Continents Map and World Map with Flags). At the bottom, we have our Metal Insets, which can be used for Math (learning shapes) and for Language Arts (pre-writing). At the very bottom, we have another giant puzzle map. This one is on the United States and every state is a puzzle piece with tiny knobs. 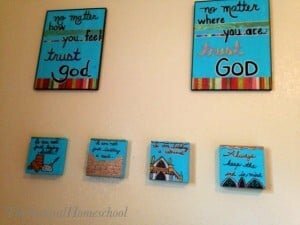 The teal paintings throughout are some that I made specifically for our homeschool room. I am by no means an artist, but I had a particular idea in mind and so I was brave and made these. They turned out ok, but the most important thing is that they have a special meaning to us. The green bins hold our Classical Conversations binders, our Classical Conversations mini binders, Kindergarten and early elelmentary activities (like the toddler ones in the re-purposed changing table, but higher level) and our daily review bin (where we have our Scripture memory cards, character traits definitions, etc). 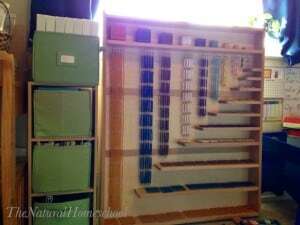 The big cabinet with the beads is called Montessori Bead Cabinet. To learn more on what it is used for, click here. On the window sill, I have an organizer with some of my materials that they don’t need to reach on their own yet (permanent markers, scissors, tape, glue, etc). I also have a couple of plants that we water regularly. Most of our Montessori work is done on mats on the carpet. This is the table we use daily for our writing activities. It is made by KidKraft and we love it. It is well-made, sturdy and very practical. The benches are put away underneath the table, so there is no wasted space. The green bin in the middle has wheels. That is where I keep my planners and our writing material (like our ACE curriculum). 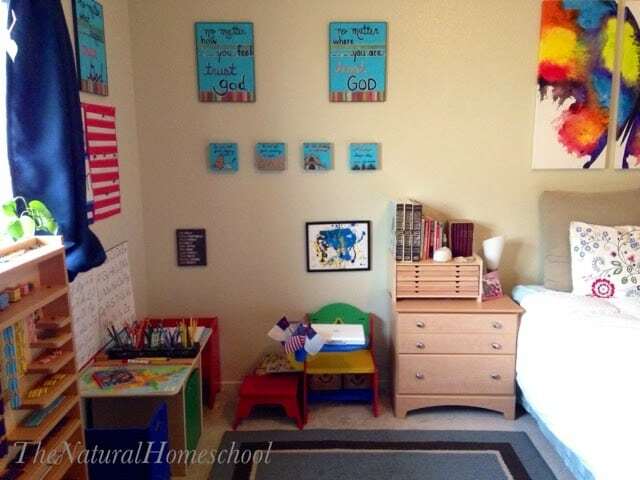 This wall is half homeschool and half guest room. Here, we have the homeschool part. We have our rack with wooden puzzles and a red wooden stool. I sit on the stool while my children are sitting at the table working. I am at their level and is more comfortable than the carpet. On the nightstand, we have our Montessori geometry cabinet. I love it that it saves us so much space and the top has a small lip, to keep things from slipping. – Our fan diffuser. We diffuse Brain Power and Clarity essential oil blends by Young Living (let me know if you are interested in ordering some from me). 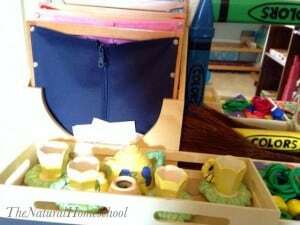 In the drawers, I have all of our Classical Conversations materials and other things that I use regularly (Montessori guides, ACE testing records, etc). Thy are easily emptied out when guests come so they have a place to put some of their clothes. We do have a big closet to hang clothes in. Half of it is used for more homeschooling materials. The smaller 6×6 paintings are also part of our redoing of our wall art. He is the story behind this project and the tutorial on how to make them. This is the guest bedroom side. Gorgeous. Relaxing. Need I say more? Well, I will. You are probably wondering where I got that amazing painting. It is an original, for sure. I bought it off of an artist that was displaying his art on the street, right in front of Ipanema beach in Rio de Janeiro. I saw it and it spoke to me. I couldn’t take my eyes off of it. I was going through some important changes in my life at the time (I had moved to a new city, got a new job, started a new phase in my life) and this butterfly represented everything I was hoping my turmoil-filled life (at the time) would eventually turn into. I am so happy that we found a place for it on our wall. It is perfect and it reminds me that indeed, my life did turn out pretty awesome (and I am eternally thankful for that). The beautiful embroidered pillowcases are from Ikea. Here is our last wall. We have a number train and an analog clock at the top. I love this number train because it groups the numbers by families or wagons, making them easier to be learned. You can find this in the ACE (Accelerated Christian Education) Kindergarten Kit. We have my free printables of the Pledge of Allegiance to the American Flag, the Christian Flag and The Bible. The bottom poster is the list of the 44 US Presidents in orden in which they have served. On the little table, we have our hermit crab environment. 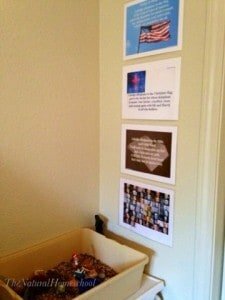 On the closet doors, we have some Scripture verses and a growth chart. 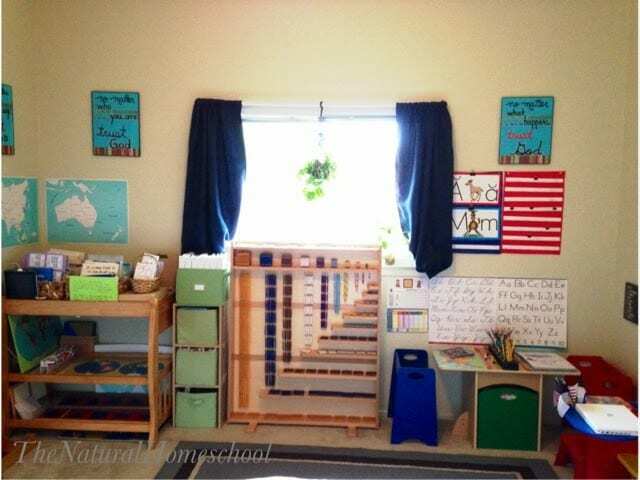 Next, we have our homeschool rules (also made by me, but this was last year’s project) and our Montessori Practical Life area. 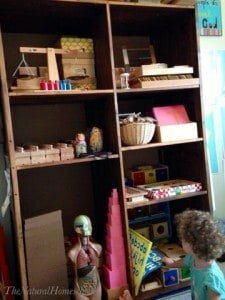 I know that it is a bit more cluttered than any regular Montessori environment would have it, but we have to do it for one important reason: space. 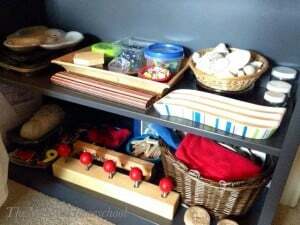 Also I find that this helps my children be more careful as they reach for things and also when they put them back. 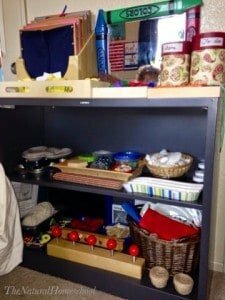 We have dressing frames, a mirror, our To Do and Done Cylinders, pouring activities, lacing, beading, looming, sorting, setting the table, nuts and bolts (set 1 and set 2) and a magnet section. We also have lids and matching containers to practice screwing and snapping lids on. On the door, I have laminated copies of the Montessori Geometric shapes that match with the Geometric Solids. I hope you have enjoyed the tour! It is our haven and we thoroughly enjoy spending so much of our time in this peaceful environment. What was your favorite part of it? 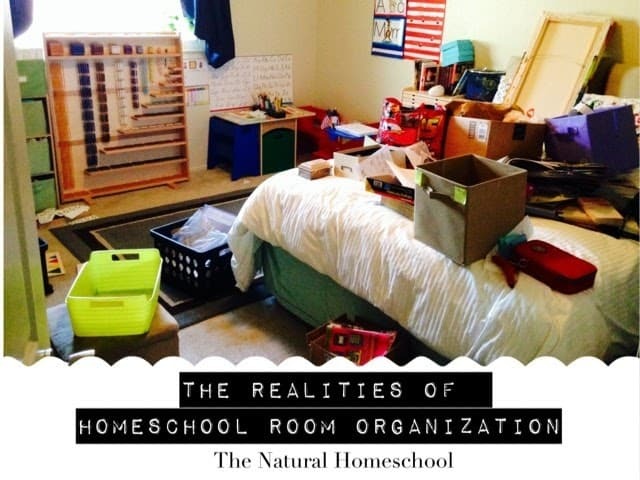 The Realities of Homeschool Room Organization. WOW!!!! Absolutely beautiful, what a great place to learn. 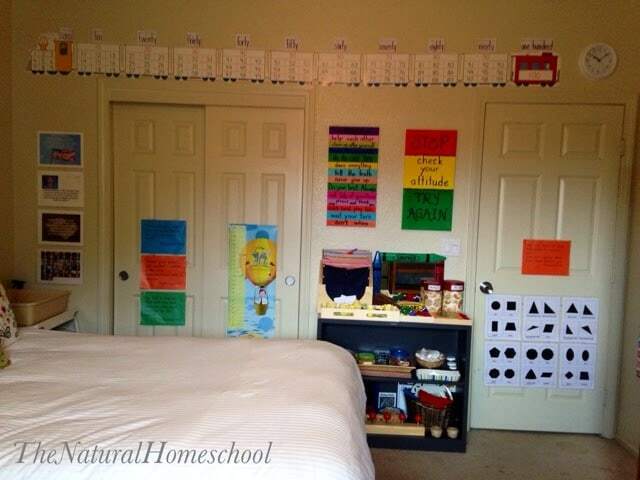 Looks like you really utilized space wisely in your homeschool room! 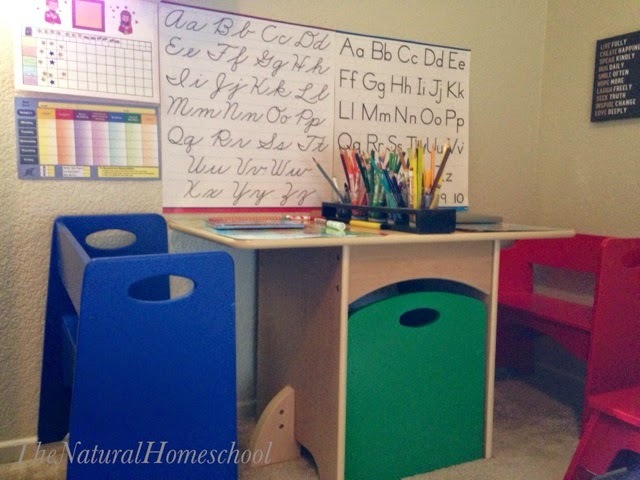 I’m getting ready to set up homeschool preschool centers in our house. 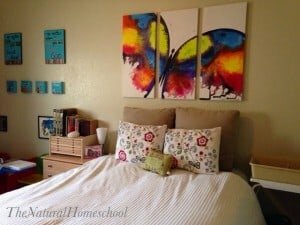 We can’t dedicate an entire room, but we’ll make do with the space we do have available (much like you are doing with your guest room/homeschool combination!). It looks fantastic! There are so many great elements! I love the artwork on the walls.! I love how you combined two rooms. Genius! That’s so much harder than just starting with a blank, empty room, I think. Great job!! I LOVE your blog. I feel our families are in similar situations, with little ones who are working well beyond their years. 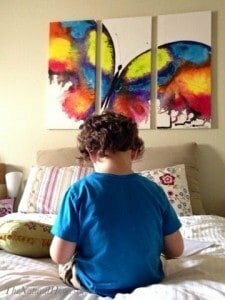 I never intended to homeschool either, and while my oldest is only in preschool, I dove head first into this. 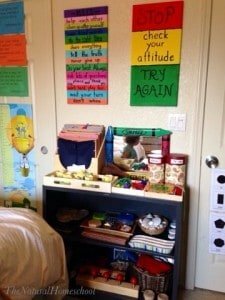 We’re currently in the process of organizing our school room, and it is so helpful to see how other families are setting up their stuff. Thank you so much! I am glad you found us! 🙂 Hope to see you back!